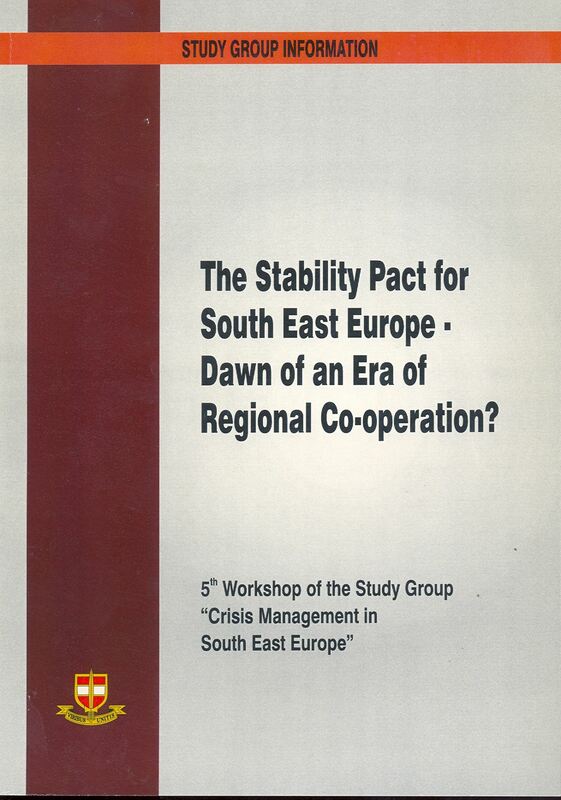 PREFACE Some Considerations about "Stability" in South East Europe 1. The Issue of Stability Some methodological considerations are necessary to the clarification of the term "stability" before the topic of the stability process and regional co-operation can be tackled. "Stability" is a key term for South East Europe both for the local as well as for the international actors engaged in the Western Balkans. It is however, doubtful, if all relevant actors have the same concept in mind when they use the term "stability". One has to differentiate between an inner and an outer dimension of regional stability in South East Europe: the concept of inner dimension is rooted in the region itself, in other words in the kind of relations between the regional actors. The outer dimension concerns the statal surroundings of the Western Balkans and the relevant international actors engaged in the region. Connected to the inner dimension of regional stability, stability means at least a "negative peace". There is no more fighting, and the preconditions are being established that will prevent new the outbreak of violence. The "negative peace", however, is but the lower end of the stability scale. One might ask the question if this status of "negative peace" and the conditions it sets have been reached at all, if for example the breaking out of renewed fighting in Bosnia-Herzegovina or in the Kosovo can only be prevented through the presence of international peace forces. High stability, on the other side, implies a "positive peace". This term does not only imply the lack of violent conflicts, but also the establishment of partnership-like and co-operative relations between the actors. With relations to the outer dimension of stability in the Western Balkans, stability signifies for the statal surroundings that there are no negative spill-over effects form coming from the region; for the international actors engaged in the region, it implies that there is no more need for up keeping a military presence in the region in order to prevent further fights. High stability as seen from this outer perspective would, however, mean the initiation of a self-sustaining peace process which allows external actors to use chances and opportunities within the region, above all economical ones. 2. The Stability Pact - a Comprehensive Concept of Stabilisation The fact that in order to reach a high level of stability, "negative peace" - the absence of war and violent conflicts - does not suffice by itself, but requires a rather high profile for the stabilisation instruments. The structure of the Stability Pact for South East Europe seems to meet these requirements. Its comprehensive structure with the three key issues of "Economy", "Democracy" and "Human Rights" as well as Security attempts to set initiatives for regional co-operation. Through this comprehensive and regional outline, the Stability Pact is set off from the former concepts of conflict management in the Balkans, which often concentrated on pacifying conflicts. One outstanding example for such an early conflict management oriented towards pacifying is without doubt the Dayton Agreement for Bosnia and Herzegovina. The first issue concerns the internal balance between the three respective subparts of the Stability Pact - Economy, Democracy and Human Rights as well as Security - and the possibility of overemphasis on one or the other. There are a number of interesting questions in this respect, such as if the solution for all security questions within the region is a precondition for economic co-operation or if an the other hand improved economic relations will help in solving the open security issues. Closely connected to this issue is the other question: can regional cooperation work, as long as conflicts of order policy between the regional actors have not been solved and the stately reconfiguration in the Western Balkans has not come to an end? To take a concrete example from the region: it is difficult to imagine that Serbia and Albania will take up close economic relations as long as the status of Kosovo has not been decided. Moreover, even between countries accepted by international law, like the Union between Serbia and Montenegro or Bosnia and Herzegovina, conflicts of order policy pose a problem for internal co-operation. Take for example the inner-bosnian conflict over a strengthening or weakening of the joint state of Bosnia-Herzegovina; the different concepts of order policy issued by Belgrade or Podgorica or the moves towards autonomy in Sandzak by the Bosniaks and in the Serb region of Vojvodina. An external observer is bound to have the impression that the International Community - and here especially the European Union - is betting on provisional concepts regarding problems of unsolved order policy. To put it - admittedly a little bit - provocative: the International Community seems to hope that through economic modernisation and regional economic co-operation, the regional actors might forget about their unsolved problems of order policy. The Stability Pact as the main and most important instrument of the Common Foreign and Security Policy of the European Union in South East Europe also seems to concentrate an economic projects and rate questions of security at a lower level. 4. The Role of the Stability Pact in the Integration into Euro -Atlantic Structures The Stability Pact is - above all - an initiative by the European Union. The European Union considers regional co-operation as an important precondition of the countries from the Western Balkans for a future membership in the Union. But also the North Atlantic Treaty Organisation is not prepared to accept countries from the Western Balkans as long as the region has not established a system of cooperative security. It can be deducted that through this conditioning, the European Union and NATO follow the strategy that only those countries will be able to co-operation within a larger political or security-political cooperation, which have proven their ability in their own, regional surroundings. In some countries in the Western Balkans, like Croatia, one can sense some mistrust by parts of the population against the concepts of regional integration of the European Union and thus against the Stability Pact. These critics claim that the Stability Pact has a final goal that outreaches regional co-operation: namely political integration of the Western Balkans. Behind this criticism one detects the fear that the national sovereignty gained in the wars might have to be given up again. Even if this criticism does not withstand an objective consideration, it might after all be an indication that the aims and goals of the International Community in South East Europe are not always that clear and easy to understand to the actors in the region. But even the European Union might be troubled by some doubts regarding the actual transmission of the concept of regional co-operation: this can be proven through the fact that next to the structures of the stability pact, the countries of the Western Balkans also have the possibility to choose individual treaties of association and stabilisation. These treaties enable those countries of the Western Balkans that have seen a faster progress in the political and economic reform process to choose earlier approaches to the European Union.